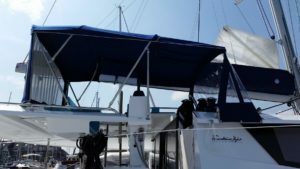 Custom Catamaran Options: We don't stop at the factory options price list! 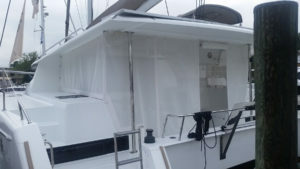 Custom ACY Bimini. Folding SS frame. 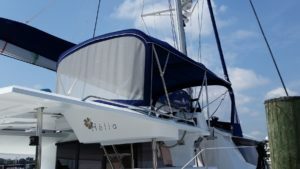 Main bimini with Textilene sun protection back. Folding/removable dodger. Removable Connector. Viewing window. Options, side curtains/enclosure. Factory Bimini, with optional rear ACY sunscreen (recommended). Options, enclosure, front wind screen. Typical factory-supplied nets with open weave allow water to pass through when sailing offshore. They are functional but uncomfortable! ACY custom net covers below, made of durable Textilene. 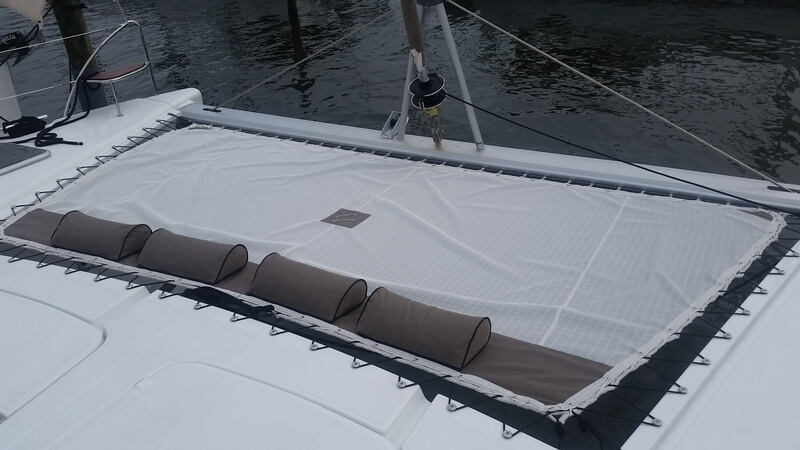 They are suitable for inshore cruising (Bahamas, Chesapeake, BVI, etc) and easily removed for offshore cruising. They are very comfortable to lie on. Closed cell foam pillows zip on so they don’t blow away, and don’t absorb moisture. Choice of colors. 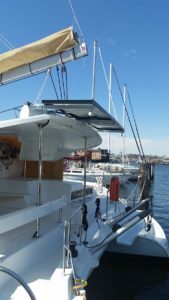 Factory option solar panels… on Bimini top, partially shaded by rigging. 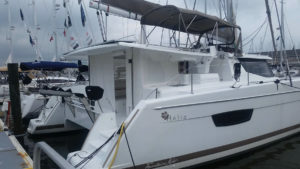 Lipari 41 with custom ACY solar panels. Larger capacity, placed aft of boom, unshaded by boom for better output. ACY panels have higher output. We can install standard solar cells from factory, or upgraded units, locally. All include controllers. 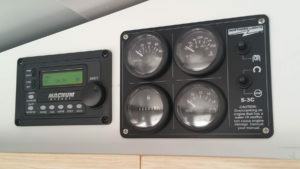 The Link Pro battery monitor will monitor inputs, but if you start getting more complicated with wind and/or water generators in addition, we might discuss dedicated power control and monitoring control systems as well. 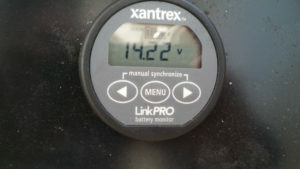 (right) Link Pro battery monitor (Provides battery status, including time remaining until charge necessary w/alarms). 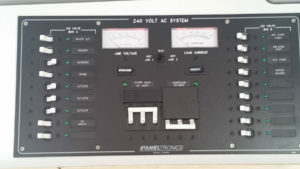 (below) Isolation transformer with multiple input voltages. 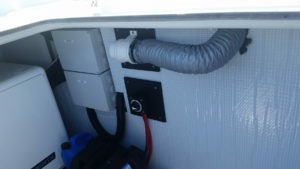 Multiple recepticles installed at stern for input of 110V, 60 cyclies, or (European) 220 V, 50 cycles. 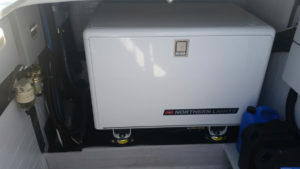 Note: Virtually all of the new equipment: A/C units, inverter/chargers, etc. are 50-60 cycle compatible. 1. Cork laminate decking, durable, lightweight, stain resistant. This is a proven product, much easier care than teak or synthetic teak for about the same price. 3. 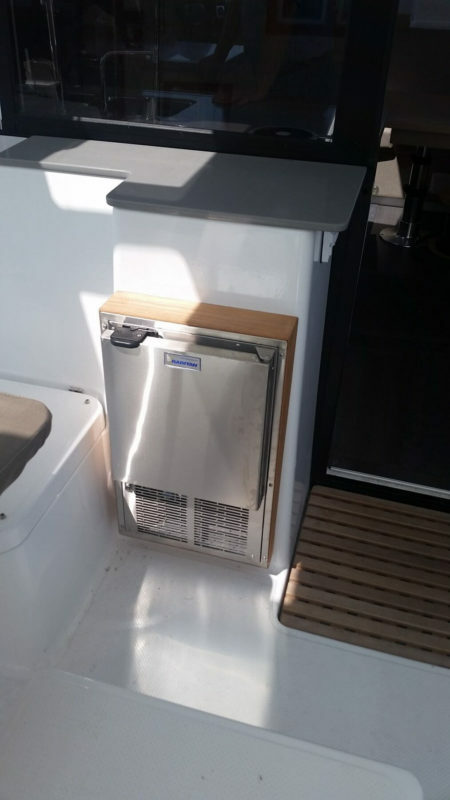 Cockpit Icemaker and other convenience appliances available. Incl: dishwasher, trash compactor, washer dryer, etc. 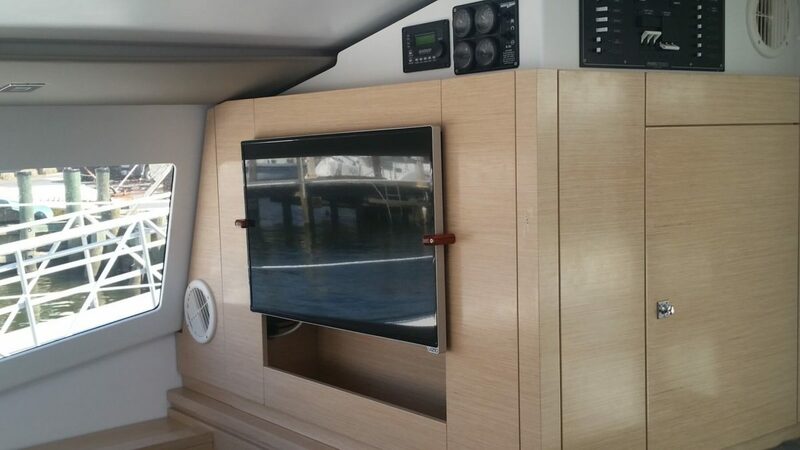 We offer complete customization and factory authorized installation of Raymarine and Garmin systems. Click Here for a completed form with all of the answers written in aside from your personal details.